Ask The Readers: Will You Sign Up For A Website You Know Nothing About? Obviously, we are not cats, but do you think you can fare better than the cats? Here is the question: will you sign up and give your particulars to a website, just because it promises exclusivity and an “exceptional” benefit that you know nothing about? That’s what 11k Club is trying to find out. 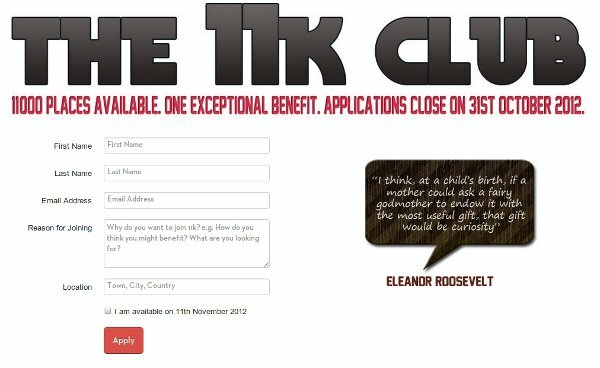 If you head over to the 11k Club site, all you will see is a sign-up form and a big heading that says only a selective 11000 people can join the club and enjoy an exceptional benefit. There is no clue to what the club is about, or what the benefit is. You only have two choices: to sign up and hopefully become one of the selected 11000, or to leave the site. From the statistics shown on the site, more than 11000 people have already signed up (13,401 applicants to be exact). To make it even more interesting, its Terms of Application stated that the more people you referred to sign up for the club, the more chances you have of becoming a member. Will you go that far for the exclusivity? Perhaps it is time for you to tell me, either via the comments or the poll below: Will you sign up for a website that you know nothing about?